.Mesin ini memudahkan anda dalam proses pembuatan kopi expresso. 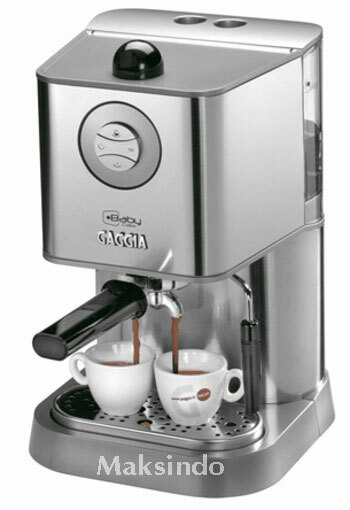 The Gaggia Baby Twin RI8159/40 is operated via the electronic touch ring, a simple touch and the Gaggia Baby Twin effortlessly springs to life. Underneath the body this coffee machine is equipped with a double water heating system. This eliminates any waiting for steam after making your base espresso shot. Easy to clean thanks to the detachable components. The ‘drip saver’ decompression system is designed to stop internal parts getting clogged or dirty. Suitable for both ground and E.S.E. (Easy Serving Espresso) pods. This coffee machine looks good, has lovely build quality and the addition of twin boilers make it a highly specified espresso machine. If you are looking for class leading specification with the style that only Gaggia can achieve, look no further than the new Gaggia Baby Twin.